For this classic carrot cake recipe, it’s important to use full-fat cream cheese for the icing; if you use a low-fat version, the icing will just run off the cake. 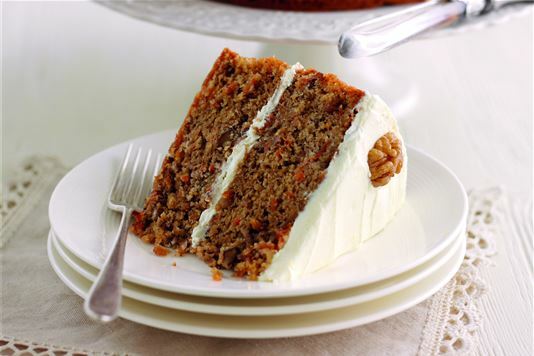 Carrot cake is beautifully moist, so keeps well. If your kitchen is warm, store the cake in the fridge. Preheat the oven to 180°C (fan 160°C/350°F/Gas 4). Grease two deep 20cm (8in) round sandwich tins and line the bases of the cake tins with baking parchment. In a large bowl, combine all the ingredients for the cake mixture as shown below. Spoon the mixture evenly between the tins. Put the cakes in the oven and bake for about 35 minutes, or until golden brown, risen, and shrinking away from the sides of the tins. Transfer to a wire rack to cool. Make the icing: measure the butter, icing sugar, cream cheese, and vanilla extract into a bowl and whisk using a hand or electric whisk until smooth and thoroughly blended. Spread half the icing on one cake, sit the other cake on top, and spread the remaining icing on top to make a swirl pattern. Decorate the top of the cake with the halved walnuts.